In 1969, Michael Crichton put himself on the map with The Andromeda Strain. The book was made into a film in 1971. It may have not been the first story to put forward the idea of a virus as the antagonist, but it certainly has not been the last. Fuelled over the years by real-life events such as the swine flu, the bird flu and SARS, writers and film makers have used this theme in such films as Outbreak (1995), 28 Days Later (2002), the Resident Evil film series and the post-apocalyptic science fiction film I Am Legend (2007). Of course, ofttimes this theme is usually spun in a way that it's the end of the world as the virus in question gets completely out of control and decimates the planet. Contagion is a realistic film and asks more realistic questions about just what may happen if a SARS or a bird or swine flu does get out of hand. Beth Emhoff (Gwyneth Paltrow) comes back from a business trip in Hong Kong and falls ill. She has a seizure and her husband, Mitch Emhoff (Matt Damon), takes her to hospital. She succumbs to this unknown illness then shortly thereafter their son dies of the same sickness. From there, we see the increasing involvement of the Center for Disease Control, the World Health Organisation and finally the military in quarantining various communities to stop the wholesale spreading of the outbreak. As the infection spreads across the globe, we are reminded how much our world is now one giant community. With air travel so prevalent, it is not in the least farfetched to see how something contagious could be easily passed around the planet before we could do anything to control it, never mind stop it. Lasting from June 1918 to December 1920, the 1918 flu pandemic or the Spanish flu killed approximately 50 million people worldwide and infected about 500 million. Out of a world population of 1.86 billion at the time, we see a death rate of 2.7% and an infection rate of 27.9%. In the film, one of the characters mentions the Spanish flu but uses the number of 1%. Considering that the world's population has reached 7 billion or is fairly close to reaching that number (nobody knows for sure), a death rate of 1% would equal 70 million. If we use the previous numbers of 2.7% and 27.9%, we would get 189 million dead and 1.95 billion people infected. An outbreak of severe acute respiratory syndrome started in November 2002 and lasted until July 2003. It started in Hong Kong and within weeks spread to 37 countries. The World Health Organisation (WHO) reported 8,422 cases and 916 deaths worldwide. The film maker ends the film by speculating on how the disease could have started and spread from Hong Kong through Beth Emhoff to infect the entire world. It emphasizes how much we are a global community and even though we as individual groups have our differences, we are really in this thing together. The idea of a virus infecting the world has been done before. However that has usually been done with an apocalyptic slant. Here we have a well crafted film telling a realistic story of what could happen if one of our recent scares like SARS actually did get to the same level as the 1918 Flu Pandemic. This is no longer a science fiction horror film, this is real; this is possible. I recommend this film and with a rating of 82% from Rotten Tomatoes; you're not going to go wrong. 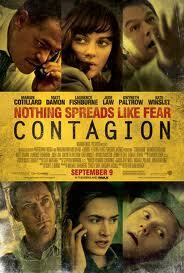 Tense, tightly plotted, and bolstered by a stellar cast, Contagion is an exceptionally smart -- and scary -- disaster movie. Contagion is a 2011 American thriller film centered on the threat posed by a deadly disease and on an international team of doctors from the CDC and World Health Organization to deal with the outbreak. The film is directed by Steven Soderbergh, and stars Marion Cotillard, Matt Damon, Laurence Fishburne, Jude Law, Gwyneth Paltrow, and Kate Winslet. The film was released on September 9, 2011. The "Spanish" influenza pandemic of 1918–1919, which caused ≈50 million deaths worldwide, remains an ominous warning to public health. ... An estimated one third of the world's population (or ≈500 million persons) were infected. The Black Death was one of the most devastating pandemics in human history, peaking in Europe between 1348 and 1350. ... It is estimated to have killed 30–60 percent of Europe's population, reducing the world's population from an estimated 450 million to between 350 and 375 million in 1400. Severe acute respiratory syndrome (SARS) is a respiratory disease in humans which is caused by the SARS coronavirus (SARS-CoV). Between November 2002 and July 2003 an outbreak of SARS in Hong Kong nearly became a pandemic, with 8,422 cases and 916 deaths worldwide (10.9% fatality) according to the WHO. Within weeks SARS spread from Hong Kong to infect individuals in 37 countries in early 2003.